Oskar Schell is a nine-year-old boy living in Manhattan’s Upper West Side with his mother and his Grandma. His father died a year ago on September 11th, and Oskar's family is still overwhelmed with grief. When Oskar finds an old key among his father’s possessions, he sets out to find the owner of the key that is his last connection with his father. Oskar has one clue, and finding the key owner will take him through all five boroughs of New York over an eight-month period. As Oskar looks for answers about they key and its connection to his father, he meets many different people with only their last names in common. Oskar is inquisitive and creative, and his mind is always filled with questions. What if we could hear people’s heartbeats? Or if the ambulance automatically flashed a sign telling you whether the person inside was someone you already know? As Oskar’s quest comes to an end, he grapples with the biggest question of all: will the world ever be the same? I read this book last January, and I loved it. I am leaving on a trip to New York City in a few days and I wanted to read a book about the city before I left. In retrospect, Extremely Loud and Incredibly Close was a strange choice, since it focuses on the city’s greatest tragedy. At the same time, Foer also captured so many of the wonderful things about New York. When I thought about the city, this was the first modern book that came to mind. This is one of my favourite books, and Oskar is one of my favourite characters. Oskar is a gifted inventor, and I loved being inside his thoughts. While Oskar is not like the average nine-year-old, Foer still managed to create a believable, yet completely unique, young boy. The first time I read this book, I loved the Oskar sections and felt the sections devoted to his Grandparent’s dragged on. This time, I thought their narrative was tragic and moving. I appreciated them much more than I did when I hurriedly read this the first time. Due to the format and the writing style, it’s a given that people are going to call this book too ‘gimmicky.’ I never found this book to be a gimmick, just unique. Foer wrote in a way that matched each character, and all the pictures found randomly through out the book made sense in the context and added a lot to the story. This book focuses on 9/11 and the bombing of Dresden, so it’s bound to be a tearjerker. Perhaps because I was alive during one of these events, I found this book to be one of the saddest I’ve ever read. Poignant and heart-rending, its one of those books that can make you feel like you’re reliving 9/11. I read Everything is Illuminated before I read Extremely Loud and Incredibly Close, and I preferred the latter. I found myself preferring the characters, and the plot was more engrossing. I’m glad my upcoming trip gave me the kick I needed to reread this captivating novel about loss. 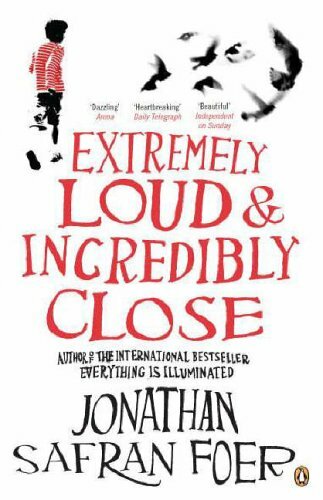 Extremely Loud and Incredibly Close is a book I won’t soon forget, that shows both the tragedy and the beauty of New York. I need to re-read this again one day. I enjoyed it the first time but I don't think I appreciated it enough.